The Miner Alumni Association and the New Alumni Council hosted a fun-packed Student Send-off picnic in St. Louis’ historic Tower Grove Park on Sunday, Aug. 3. The event drew more than 200 alumni, current and incoming students, and their families for a taste of St. Louis that included Kenrick’s barbeque and frozen custard from Ted Drewes. 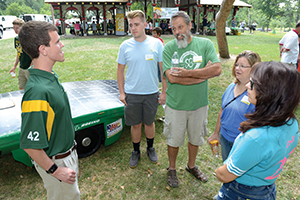 The Student Design and Experiential Learning Center exhibited several recent student design team projects. A prize raffle awarded S&T Store gift cards to students and T-shirts to alumni. Stories about the road to and through Rolla helped Miners, new and old, catch the Miner spirit.